Does Sony have any intention of allowing cross platform gaming for PSN titles? I would love to be able to play some Joe Danger, or Dead Nation at home on my PS3, pop the save to the cloud, and then launch and continue to play these titles on the go on the Vita. I know you can do this with upcoming Vita title, Ruin, but if this is possible, wouldn't you want to do this with all PSN titles? Just saying. If someone else out there has the answer, please let me know. I also would like to have a 3G connection that will allow network play, and not cost an arm and a leg. It's a pipe dream, I know, but who wouldn't want that? We'll see more about this soon, as Japan's launch draws closer, but for now all we can do is make our own wishes known. 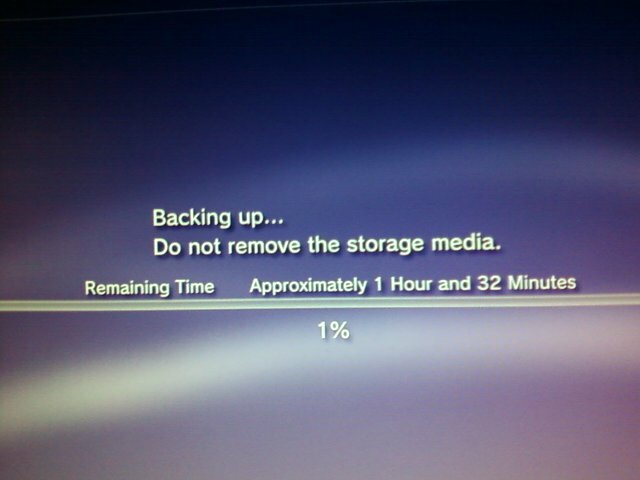 Are you listening Sony? This is a test, brushing and hopefully... New Beginning? So, as I wait for my tasty burrito, I think it might be time to take this blogger app for a whirl. I've been wanting to have an app that makes it super easy to share things right when they happen. Hopefully this is just that thing. I know I could just tweet, or post to Facebook or Google +, but I just like the idea of posting directly to the blog. So does this mean I'll be writing more? Who knows, we'll see after this post I suppose! Later all! 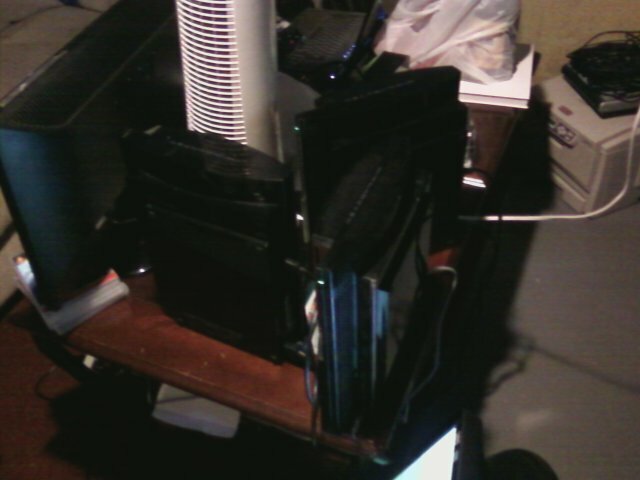 Here sits a trifecta of ps3s ready to go to battle in Warhawk. The slim is lonely on the shelf to the right. Poor slim. Turn Back the Clocks and Crank up the Trophy Counter! Let me preface this review by saying one thing; I LOVE Strategy RPGs! That being said, and given my love for the genre, I will still attempt to provide you with a non-biased opinion of this downloadable title. I remember the first Vandal Hearts game quite well. It and the sequel to follow were games that were in a consistent rotation that my friends and I would play over summer breaks during high school and the early years of my college career. The quirky, yet serious graphics and the over the top way the characters on screen would look like someone hooked their veins up to a fire hose when hit, (even the skeletons) are things that I still remember today. I was delighted to find that all these years later, Konami and Hijinx Studios partnered to bring us a prequel to the original Vandal Hearts as a downloadable title for the PSN and XBLA. So what did I find when I transferred my hard-earned $14.99 to the PlayStation Network Store? Ok, I’ve been reading a lot everywhere about the look of this game. I’ve heard things like “Atrocious”, “Gag Reflex Inducing”, and “Saturday morning cartoon reject”. (All from the same source there, looks like that reviewer REALLY didn’t like the graphics.) So, are they that bad? When you take them in context of this being a downloadable that is obviously targeting a demographic that cares really little about anything but that fact that they have a new, cheap, downloadable Strategy RPG on a console…no. When you compare the graphics to say the likes of Final Fantasy XIII or other AAA titles on game discs for the same consoles, sure, they’re not the best. Though there is something about them that helps to turn on that nostalgia while perhaps having a little fun as well. (Such as the way the cutscenes are handled. Very similar to early Sega CD and Playstation games, the cutscenes look as though a camera is being panned over a painting with subtle motion to accentuate major actions.) The pint-sized nature of the characters, although kind of strange, fit oddly in the perspective of the settings you see them in. But in the end, they didn’t detract from my experience one bit. The soundtrack and ambient noise help to take you on the journey, but they’re far from what I would consider stellar. When the average battle is around ten or so minutes long, you want something to listen to that is pleasant. That being said, the audio isn’t horrible either. The melodies for travel, the sounds in towns, and the themes of battle all feel like they belong and help to transport you along the adventure. From the semi-generic in game sound effects, to the average but not bad soundtrack, to the nice touch of some decent voice acting, (while not the best) the audio here gets the job done. There is not a great deal to be said about the controls here. 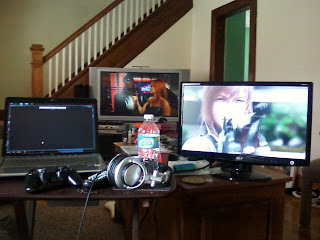 They are pretty standard faire for the Strategy RPG gamer. I don’t want to sound cliche here, but if you’ve played a SRPG before, in terms of controls, you’ve pretty much played them all. In short, SRPG players will feel right at home here while newcomers won't feel bogged down with something too unfamiliar. It might actually be broken record time here. Everything from navigating the in battle grid, to the shops, to the world map in Vandal Hearts: Flames of Judgment screams “SRPG Gamers know how to do this”. It’s also, however, easy enough for anyone else to jump in and very quickly get comfortable with play. Besides the fighting, you are also given the option to uncover secrets by searching areas of almost every battle grid. This often results in something nifty, so it's worth it. For those that are looking for trophies, you'll be needing to do this a great deal. The story of Vandal Hearts is a simple one. You play as young Tobias Martin, who is whisked away on a journey across his home continent of Sostegaria. Along the way, he'll be joined by friends from his hometown, and meet allies along the way. The forces of evil have once again arrived to threat the peace that has been over the land for some time now. But a closer look may reveal that the evil that lurks may arrive from a place that no one expects. Sound familiar? To many RPG fans, this is the story that most crops up in these types of games. Is it a bad thing? No. In fact (not meaning to overuse a qualifier here) for a downloadable title, the story here is something with a little more meat than I first expected. I was expecting there to perhaps not be a narrative at all. The story is, however, not even close to the depth of a full disc title of this generation. Those coming to this title looking for an epic tale they haven't heard might want to look elsewhere, but the story you see unfold here is enough to keep you moving through to the end and still be mildly entertained. Are you looking for a 100% Completion? Are you looking to score all of the lovely Trophies/Achievements that this title has to offer? No? Oh, well, this might be a one and done game for you. But if you are looking for those things, then you're a friend on mine and in for at least another playthrough! In order to sap this title for all it's worth, you can streamline your gameplay to only two playthroughs in order to experience the two endings the game has to offer. I can say that even after I've completed the game and played through to receive all 12 trophies in this title, I've found myself playing a few more battles just for fun. But maybe that's just me. RPG Gamers, fans of the SRPG sub-genre, and Trophy/Achievement Hunters should PICK UP this title. It's only fifteen bucks and can be used as a light snack between larger RPGs like Final Fantasy XIII or Demon's Souls. For those Hunters...you can complete this title in a speed run of about 6-8 Hrs. The requirements aren't that hard either, so don't worry about trying to find a guide. Those curious about the genre would also do well to pick this up, but please note that this game is just a taste of a much more complex form of gaming. Don't like RPG's or SRPG's? Couldn't care less about Trophies/Achievements? Well maybe you might want to take a PASS on this title. It won't do much to turn you into a believer, and if the thought of turn-based strategy gives you a sour stomach, there isn't anything else in this title to offer you. Thanks for reading this review, and feel free to comment! I look forward to reading your feedback! Here sits my 60 GB PS3. Turned on, working, and most importantly...able to read the hard drive so I can back up my data!!! A glorious day indeed! So, here's a word to all that may have experienced a power supply death on the 60, 20, 40, or 80 GIG models; If your power supply died, go to ebay, and buy a new one for 25 beans. Then, it's an easy install...1 screw to get into the top of the case, 7 screws to get in from the inner case, then two plugs, five screws to release the supply, and don't forget to take the tape that holds the black cable down so you don't pull it out of the solder! Then it's reassembly, and testing. If it turns on, yippie for you! Now BACK UP YOUR DATA! Then have fun! So thanks to the dude from ebay who sold me the power supply, and to my friend Ken who looked up a disassembly guide! Yea! 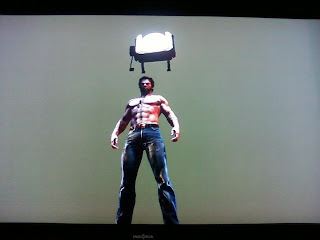 Here's an example of when I brake a videogame. In this picture we find out what happens when Logan decides to take a stroll outside the confines of a level of X-Men Origins: Wolverine. Guess Logan didn't want to be anywhere near this pretty poor licensed movie title. Too bad there's no way out of where he landed! Welcome! What can you expect to find here? Well, you'll find the views and opinions of one Richard Heywood, co-owner of Bacon Ice Cream Productions. What does he do? Well, in his writings, he trys to point you all to the things that he and the rest of the BIC Crew thinks is important in geek culture. You might think of him like you would a compass, for geeks! So welcome to Calling All Gamers, and the Bacon Ice Cream Community! Community Links...Join in and be heard! 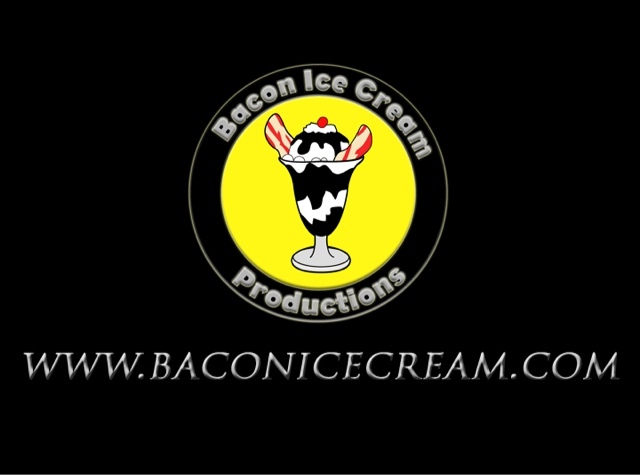 Bacon Ice Cream's Official Web Page! Bacon Ice Cream's Official Forums! <-- To get all the latest episodes of Calling All Gamers, subscribe by clicking this button!! Will work for Mac and PC!! What's Playing on Calling All Gamers!